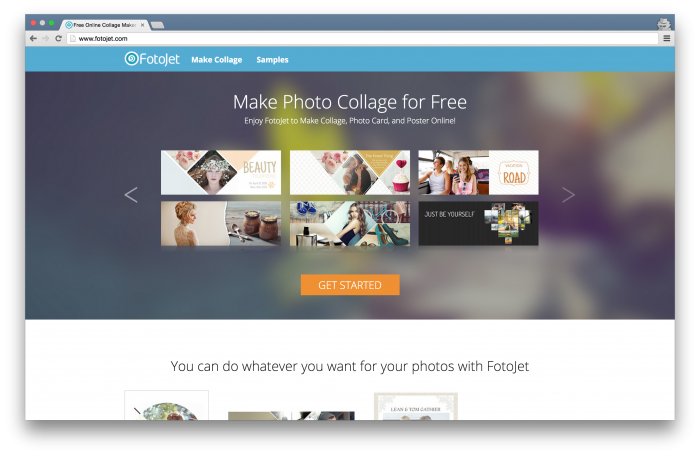 Have you ever meet a web app that’s all in one for collages, posters, photo cards and even social medias? Here FotoJet is such one that surprises me a lot! When you get using it, you will be shown a large assortment of templates for various occasions such as Anniversary, Baby, Wedding, Birthday, Travel, Graduation, Facebook Cover, Facebook Post and more. It works flawlessly in any browser. You can leave out the hassle of buying or downloading any software on your computer. What’s more, there is no need to register before using it! There are totally 320+ gorgeous free templates available in this web app, with which, you’ll never be stuck for inspiration! Browse all kinds of perfectly designed templates; you will be sure to find your favorite one. After choosing the desired template, you are allowed to add your own life photos from local disk or from your Facebook album to fill it. All the photos you added will be shown as thumbnails on the left photo list. Simply click Auto Fill to fill your photos to template automatically, or you can manually drag any one photo and drop it to a specific frame you like. If the arrangement of photos does not suit you, you can zoom, move, rotate, flip or mirror them with its straightforward image-editing tool. If you need to further enrich your photos, beautiful filters and advanced color adjustment are available to help. There would come with some preset text on the template, you are able to edit it with your own words by clicking on the text box and then inputting the words you want. That’s not all. This browser-based app also enables you to set the text font, style, size, color and alignment. Once you are done with your final design, you can save your images as either PNG or JPG files. Besides, if you are a Facebook fan, you can directly go to share you design to Facebook with your friends and family. That’s it! It’s super easy to make a collage, a poster, a photo card or a personalized Facebook cover online. You will NEVER know how fascinating and quick this online app is until you try it out. Take a look at the samples!